This is the author’s second published novel. It is his unvarnished coming of age story. It is the story of a young European going to the United States for the first time, and joining the Marine Corps; and his trials and tribulations during his training as a Marine Officer and a Naval Aviator, and his eventual deployment flying helicopters in Vietnam. It is available on Amazon, in both Kindle and paperback. 5.0 out of 5 stars– Great new book by Peter Dunev! Dunev has this narrative skill of putting you, a teenager, at the controls of a troop transport helicopter in the middle of the VietNam war, chasing skirts all over the world, and approaching his life afterwards with an open “what’s next”? Growing up in Spain and entering the US military in his late teens, Dunev’s writings provide an unusual perspective of how differently he viewed the world than his new American comrades. He also presents an interesting overview of military pilot training in the VietNam era, incredulous attitudes of the pilots and soldiers in-country about “the mission” there, and the frustrations inherent in the military bureaucracy. Strongly recommended reading for ALL pilots! 5.0 out of 5 stars – A Journey of Truth and Discovery! The Wayward Marine is a very honest and authentic tale of a journey that takes you from Vietnam to Wall Street. It’s a ride worth taking. The Wayward Marine is a very entertaining autobiography of an American born and raised in Spain, and how that affected his Marine Corps career: a stranger in a strange land. The author describes the sometimes humorous but potentially disastrous effects of the cultural differences he encountered after enlisting in the Marine Corps, and dealing with the even more-demanding standards he encountered after acceptance into the MarCad program, quickly elevating him from a newly minted Private to a 2nd Lt Naval Aviator. As a Vietnam vet I can relate to the feelings and trepidations he recounts in this book. I can also relate to the problems he experienced transitioning from the stress and priorities of being a participant in a war zone, where as a 20 year-old (page 57) he shouldered the awesome responsibility of being a Helicopter Aircraft Commander, routinely making split-second life and death decisions, to returning to a world populated with clueless and coddled civilian contemporaries with their vapid concerns and values. This was a very illuminating and insightful look into four years in the life of a spoiled young man turned into a battle-hardened Marine officer, and how that changed his life. 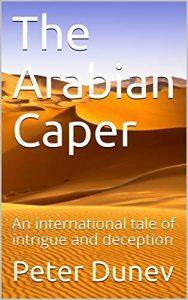 My only criticism, as with his first book, The Arabian Caper, is that it wasn’t longer. A satisfying read. Interesting read. I’ve several close friends in the Corps with shockingly similar (non-aviators) stories. Just more proof that one can navigate life in the USMC, as long as you know when to hold-em, fold-em and play-em. Very much enjoyed the book! Semper Fi. A great first hand experience of the training it took to make it to Vietnam and come home.